AK Press, in conjunction with the Institute for Anarchist Studies (IAS) will publish Octavia's Brood: Science Fiction From Social Justice Movements! From the books editors, Walidah Imarisha and adrienne maree brown: “We are so ecstatic to share the list of contributors to this project, and to thank the folks who have shared their work, their words, their vision with us and Octavias’ Brood: The book will include short stories from LeVar Burton, Terry Bisson, Alexis Pauline Gumbs, Alixa Garcia, Autumn Brown, Bao Phi, David Walker, Dani McClain, Dawolu Jabari Anderson, Gabriel Teodros, Jelani Wilson, Kalamu ya Salaam, Leah Lakshmi Piepzna-Samarasinha, Mia Mingus, Morrigan Phillips, Tara Betts, Tunde Oluniran, Vagabond, adrienne maree brown and Walidah Imarisha, essays by Tananarive Due and Mumia Abu-Jamal, as well as an introduction by Sheree Renee Thomas. As editors, we both knew it would be a massive amount of work but were committed to it. However, once we were immersed in the process, we found it was even more work than we could have imagined. It has turned out to be more than we actually have capacity to do on our own, especially as we move into the realm of distribution. We wanted above all else to ensure that Octavia’s Brood is the highest quality anthology, to honor the lovework that we as editors – as well all of the writers and everyone who donated and supported the project – have poured into it over the past four and a half years. We have determined that going with an aligned publisher will allow us to actually focus more on the touring, workshops and sharing the work with all of you in ways that move beyond just book readings. The one major change for you all to know about is that we have a spring 2015 release date. So… a little bit longer to revel in anticipation. We know so many of you (550!) generously contributed to our indiegogo campaign, and we want to assure you those funds are still needed and very much appreciated. Going with a publisher allows us to use those funds to provide some small compensation for all of the writers who have been working on these stories for years. It also allows us to expand our tour – meaning we can bring more writers for book readings, more workshops, more organizing trainings, and more sci fi house parties to each of yall’s cities! 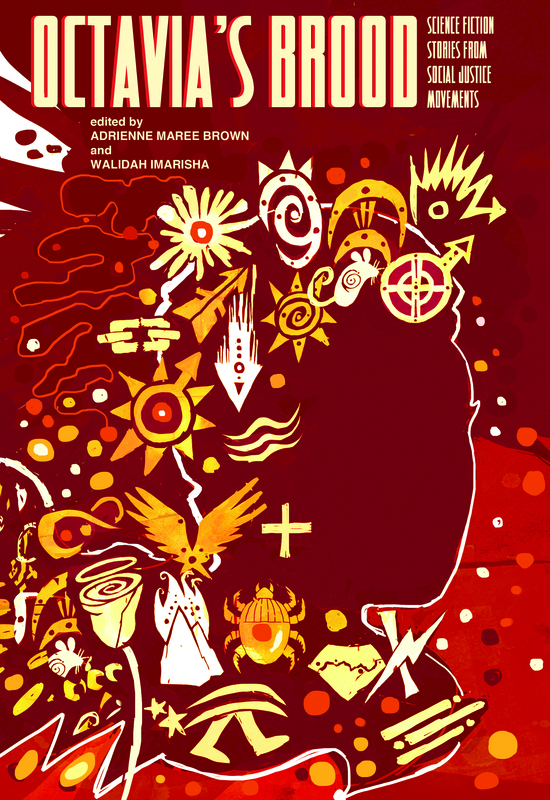 Walidah and adrienne mare” The anthology consists of radical science fiction/speculative fiction/fantasy/horror/magical realism short stories written by activist-writers who are actively involved in building movements for social change. They use their experience doing community work as the muse for their fiction. The collection will also include essays about the radical potential of science fiction by people like award-winning science fiction writer Tananarive Due and award-winning journalist and political prisoner Mumia Abu-Jamal. Octavia’s Brood (to be released spring 2015) is the first book to explore deeply the connections between radical science fiction, what we call “visionary fiction,” and movements for social change through the vehicle of short stories. We believe that radical science fiction is actually better termed visionary fiction because it pulls from real life experience, inequalities and movement building to create innovative ways of understanding the world around us, paint visions of new worlds that could be, and teach us new ways of interacting with one another. Visionary fiction engages our imaginations and hearts, and guides our hands as organizers. Many radical minds believe this field was evolved by late science fiction writer Octavia Butler, for whom this collection is named. Butler explored the intersections of identity and imagination – exploring the gray areas of race, class, gender, sexuality, militarism, inequality, oppression, resistance and most importantly, hope.